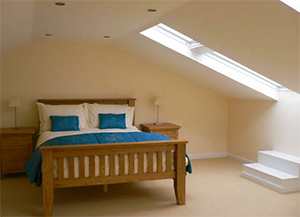 Well known for Liverpool loft conversions Fiveways Contractors were called to the Monaghan household in L15 and asked if we could convert a disused loft space into a functional bedroom/living area for their daughter when she returned home from University in Newcastle. The Monaghans’ ideas for the conversion didn’t lend themselves to the space but with guidance, help and advice from Fiveways Contractors we were able to modify their plans to devise a refined brief, methodical course of action and systematic project scope. The Monaghans were then given a detailed breakdown of costs, procedure and timescales and, upon acceptance of the proposal, work began a few weeks later. Fiveways’ tradesmen arrived on time each day, tidied before they left and the customer commented on how respectful our workers were and how they went out of their way to make the project as non-disruptive as possible to their everyday lives. The project was completed on time and under budget. The Monaghan’s were delighted with the result, so much so that they recommended Fiveways Contractors to another resident on the street who asked us to quote for a kitchen refurbishment. The Monaghans’ daughter is now in residence in the loft conversion and, to her parents’ delight, paying rent!